Making the switch is usually fast and easy, very rarely experiencing any difficulties. At True Carnivores we are not veterinarians. True Carnivores staff are educated, our writing is researched and are practiced on our own animals. The advice of a True Carnivores staff member nor reading True Carnivores written materials can substitute for visiting a veterinarian, especially those in the practice of holistic methods. We offer carefully chosen, natural products that can benefit your pet, however we do believe that veterinary conditions should be diagnosed and treated by professionals. Making the switch to raw with your dog is an exciting and fun adventure. Sure, it may look and feel a little overwhelming at first, but once you’re comfortable with proteins, bones, tripe, treats, and chews the fun begins! At the beginning, we recommend choosing one protein to give to your dog over the course of the first 7-10 days then gradually expanding. Typically, we recommend starting with something simple such as turkey, we find it easiest to work with and it is high in bone content (High bone content will help firm your pups’ stools so they are less likely to have an upset tummy). 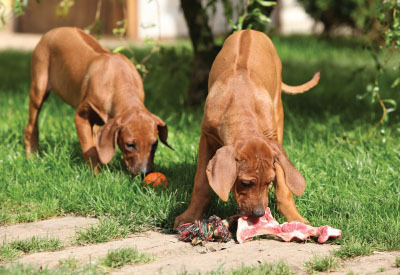 Once your dog has sampled its new protein sources, begin rotating different proteins every few days or so as this ensures your dog’s diet has plenty of variety. If your dog is used to eating commercial foods then he/she may be a little fussy when it comes to dinner time. Older pets can sometimes take a little more patience and little bit of coaxing. Puppies and young dogs have the easiest time transitioning onto raw as this is natural for them. Transitioning your dog is the easy part. Remember start simple, pick a method “soft transition” or “cold turkey”, pick a protein, thaw & serve! Click over to our learning centre for more information on supplements, what to expect during your transition, feeding raw bones, and more! Making the switch to raw with you cat can be exciting – it can also prove slightly trivial as cats are more reluctant than dogs to make large changes in their diet. This should be expected when trying to wean them onto raw food. Ideally, feeding a biologically appropriate diet would be introduced as early on as possible so that the cat learns what to look for and eat as they are imprint feeders. At the beginning, we recommend sampling an array of different brands and proteins with your cat to see which once they like. 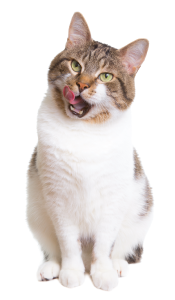 If your cat is used to eating commercial foods then he/she may be a little fussy when it comes to dinner time, but don’t let a challenge stop your cat from getting the proper nutrition! Older pets can sometimes take a little more patience and little bit of coaxing too. Kittens have the easiest time transitioning onto raw as this is instinctually a natural diet for them. Click over to our learning centre for more information on transition methods, what to expect during your transition, feeding raw bones… etc.! The answer is to these questions are yes! Your pet should be drinking less water after switching to raw food. This is a good thing! 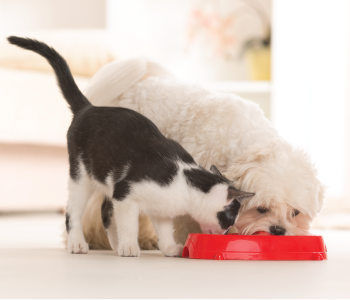 Raw food itself contains lots of moisture that your pet puts to work without needing to drink more from their water source, but it’s also important to keep fresh water available. 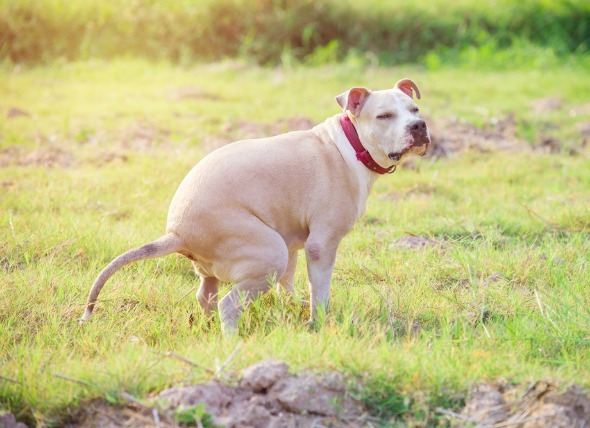 If your pets stool is smaller and les stinky it is because your pet is now utilizing all its nutrients and there is barely anything left for the body to dispose of. Unlike a diet on processed food that is full of carbs their stool is less frequent and smaller in size – overall, a much less offensive experience! Weight loss – some pets see weight loss immediately, others can take a little time. Since your dog/cat is no longer eating a mass amount of carbs they are no longer being bloated. They start to form a bit of a waist and will begin showing more signs of exuberant vigor! This is a small list of things you can expect – for more information check out or learning centre for dogs or cats! Sometimes before you see the sun, it’s’ gotta rain – dogs and cats, from time to time, release toxins and unwanted substances through various areas of their bodies. This is completely natural, and when switching to raw food, it can show itself in many ways. These are all signs that their body is getting rid of toxins and they are on the road to a healthy lifestyle! For more information check out or learning centre for dogs or cats!